Artist's concept of the European Space Agency's Gaia spacecraft mapping stars in the Milky Way galaxy. Gaia may discover 70,000 exoplanets if its mission continues for 10 years, researchers have found. A European spacecraft that launched late last year could eventually discover 70,000 exoplanets, helping researchers better understand the number and characteristics of alien worlds throughout the galaxy, a new study reports. The European Space Agency's star-monitoring Gaia mission, which launched in December 2013, should find about 21,000 alien planets over the course of its five-year mission and perhaps 70,000 distant worlds if it keeps operating for 10 years, the study found. The first alien world around a sunlike star was spotted in 1995. Since then, astronomers have found nearly 2,000 exoplanets, with more than half of the discoveries made by NASA's Kepler space telescope. But there are many more out there, waiting to be discovered. Astronomers think that, on average, every star in the Milky Way hosts at least one planet, meaning the galaxy probably teems with more than 100 billion alien worlds. The $1 billion Gaia mission operates from a gravitationally stable spot 930,000 miles (1.5 million kilometers) from Earth called the Earth-Sun Lagrange Point 2. 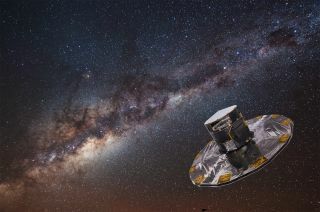 The spacecraft's main goal is to catalog and closely monitor 1 billion Milky Way stars, helping researchers create a detailed 3D map that should shed light on the galaxy's structure and evolution. But Gaia's precise tracking work should also reveal the presence of many alien planets by noting how their gravity tugs the stars slightly this way and that, researchers say. Perryman and his colleagues wanted to get a better idea of just how many alien worlds Gaia could be expected to find. They arrived at their estimates after integrating a number of sources of information, including a comprehensive model of Milky Way star and planet positions, the latest exoplanet-distribution data (much of it from Kepler) and details of Gaia's measurement capabilities, researchers said. "Our assessment will help prepare exoplanet researchers for what to expect from Gaia," Perryman said. "We’re going to be adding potentially 20,000 new planets in a completely new area of discovery space. It’s anyone’s guess how the field will develop as a result." The new study has been accepted for publication in The Astrophysical Journal and is available now on the preprint site arXiv.